Some 41 percent of adult men are overweight, much higher than 24 percent for women, according to an obesity report that showed the correlation between body size and income. The report was released by the National Health Insurance Service based on 13.95 million people who received medical checkups last year. Results showed that 41.28 percent of men and 23.74 percent of women were overweight, meaning their body mass index exceeded 25. 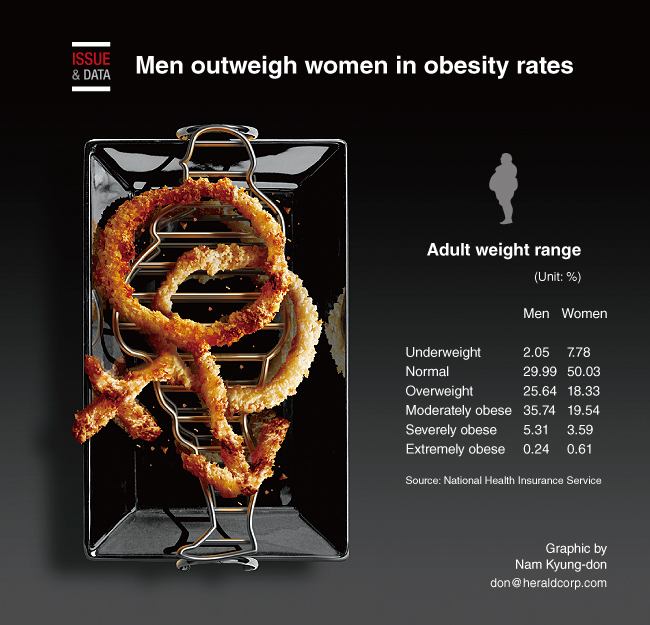 According to the findings, 29.99 percent of men were in the normal weight range. The number compares with 25.64 percent who were overweight, 35.74 percent who were moderately obese and 5.31 percent who were severely obese. Among men in their 30s, 46.26 percent were above the normal range of 23 in their BMI.